The name Blackhawk is very familiar to the world of classic cars being renowned for dealing with some of the world's most glamorous cars for the last decades. Beside a large showroom of the subsidiary �The Auto Collection� at the Imperial Palace in Las Vegas the name Blackhawk is resident in Danville, about 30 miles east of San Francisco. In 1988 the Blackhawk Museum was opened to show some of the cars for sale plus many others to the public in a modern 70.000 sq-foot building. Operating from the picturesque Victorian farm buildings set in Hertfordhire countryside, but just 20 miles from the centre of London and 10 miles from Heathrow airport, DK Engineering are largely accepted as the world�s leading Ferrari specialists. Concours winning restorations have been carried out by DK for some of the finest and most famous collections in the world including those of Sir Anthony Bamford, Ralph Lauren, Chris Evans, Eric Clapton, Paul Vestey, Peter Glaesel and many more. Thirteen, lucky for some, unlucky for others! It was certainly a lucky number for those who attended the 13th Goodwood Revival Meeting over the weekend of 17 - 19 September, as apart from fantastic close racing, and the wide and varied peripheral activities, the weather remained predominantly warm and sunny throughout the weekend, despite forecasts to the contrary for the Sunday. Apart from the regular activities, there was also a celebration of 60 Years of BRM, a Tribute to John Surtees, who made his car race debut at Goodwood in March 1960, and also a poignant remembrance of the 70th anniversary of the Battle of Britain. The annual Auto e Moto d�Epoca show was held a Padova�s Fiera exhibition centre over the weekend of 21 � 24 October. For 2010, Thursday 21 October was added as a preview day for invited guests, and those wishing to avoid the crowds by paying a premium entry fee. The show is almost certainly the premier classic car show in Italy, with easy access. The Coppa d'Oro delle Dolomiti started on Thursday 10.00 - 16.00 o'clock at the Piazza Venezia with the Competitors welcome and the technical checks, followed by the Competitors briefing and the Dinner Party at the Cristallo Hotel. The fifth annual Salon Privé gathering was held at its regular venue, the exclusive Hurlingham Club, on the banks of the River Thames in South West London. The event is a high end outdoor motor show, with the addition of a classic car concours, �Beautiful People�, headed this year by Miss Great Britain, plus lifestyle brands like Audemars Piguet, Boodles, Six Senses Resorts & Spas, Ventura (UK) agents for Riva powerboats, Vertu and Vranken-Pommery Monopole, whose Pommery Champagne flowed freely for the duration of the event. The Silverstone Classic is back to the prominence in classic motoring circles once enjoyed by the Coys Historic Festival at the same venue a few years ago. The 2010 running was a bumper edition, with full and sometimes oversubscribed grids, a vast array of one make car club displays, expansive vendor areas, rock bands in the evenings, and a large funfair for the young in mind and body if interest in the on track activity waned, making it a great event for the whole family. Gooding & Company sold 13 cars over $1mio and achieved a record results with $64mio. McLaren took the opportunity to launch the new McLaren MP4-12C. The Prancing Horse�s cars racked up no less than three world record prices in their categories this year: a 1959 Ferrari 250 California Spider Competizione LWB, which dominated the entire event, was sold for 7,260,000 dollars (5,299,000 euro) while a 1961 Ferrari 250 GT Berlinetta SWB made 6,105,000 dollars(4,051,000 euro) and a 1952 340 America Spider 2,530,000 (1,846,000 euro). An an exceptional 1954 Ferrari 375 MM Berlinetta, the fifth of only seven examples built and exquisite 1938 Talbot-Lago T150-C Lago Speciale Teardrop Coupe with coachwork by Figoni et Falaschi, each sold for $4,620,000 at RM�s Sports & Classics of Monterey Saturday night, leading an impressive group of 14 individual million-dollar-plus sales. Friday the 13th was one of these days during the Monterey week that was packed with events. After a visit at the Concorso Italiano in the morning we headed for the Quail just after Lunch. When parking the car outside the resort it already became clear that this event has a totally different approach to the theme than the Concorso in the morning. The Rolex Monterey Motorsports Reunion was a celebration of motorsports history that reunited authentic race cars with a world-class track. Automotive history came alive with such marques as the remarkable pre-war Bugattis, Alfa Romeos, and Talbot-Lagos to the more powerful Ferraris, Corvettes, Cobras and Porsches racing through the corners and down the famed corkscrew. The Rolex Monterey Reunion entered a new dawn of historic racing by honoring one of the true legends of motorsports- Dan Gurney - the Cars He Built, the Cars He Drove. Pebble Beach Concours d'Elegance Names 1933 Delage "Best of Show"
A 1933 Delage D8S De Villars Roadster owned by The Patterson Collection in Louisville, Kentucky, was named Best of Show at the 60th Pebble Beach Concours d'Elegance held Sunday on the 18th fairway of Pebble Beach Golf Course. Additionally, proceeds from raffles, auctions, sponsorships and ticket sales helped contribute more than $1 million to charity for the fifth consecutive year. Friday is concours day once again! 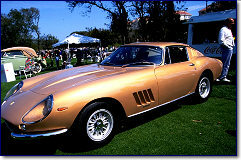 On the schedule the Concorso Italiano at the Laguna Seca Golf Ranch and The Quail at Quail Lodge in Carmel Valley. Concorso Italiano always attracts a vast number of Italian cars, plus there is an area set aside for non- Italian exotica. The Ferrari element of the event is usually the largest, and this year was no exception with over 350 examples on display, looking like a predominantly red carpet flowing down the fairway. The history of Bentley is closely linked to the history of the 24h of Le Mans. Today the race is important for the manufacturers to show their advanced technology but in these days it was even more important to show the reliability of the cars in an 24 hour test on the most demanding circumstances. Just after the pre-reunion in Laguna Seca the concours week at Monterey officially opened on Tuesday the 10th of August with the forth edition of the Concours on the Avenue in Carmel. Most of the events during the Monterey classic week have highly priced entrance fees as they are for charity but the Concours on the Avenue is the exception. This event is held on the public Ocean Avenue in Carmel and totally free for the public. Surely this attracts many visitors to take a peak at the cars even if they are not car fanatic and therefore it helps to delight even more people for classic cars. The 5th running of the bi-annual Le Mans Classic historic car race meeting took place over the weekend of 9-11 July, gathering a fine array of wonderful machinery to the 13.6kms long Sarthe circuit in central France. Apart from all the on track activity, there is a large gathering of car clubs, a trade village and a variety of entertainment from music to circuit tours and helicopter rides, which all combines to provide a spectacular weekend for the classic car enthusiast. It is anticipated that were around 6000 classic cars. In a hot, packed saleroom in a vast tent erected inside the legendary Le Mans race circuit, Hervé Poulain celebrated 40 years of car auctions by knocking down 73% of the 60 automobiles presented at Le Mans Classic on Friday 9 July.1 The noise outside of cars in practice, for what drivers and connoisseurs of vintage racing-cars consider their top event, added to the saleroom buzz. Dutch anamera reader Michael Tange contributed 152 images from a great Peter Auto organized event. The 458 Challenge has made its world premiere debut in Maranello during the Annual Dealer Meeting, a traditional event that brings together the representatives of Ferrari�s international sales network. The new berlinetta, which will flank the errari F430 Challenge in the Ferrari Challenge Trofeo Pirelli in the 2011 season, is the fifth model used by Ferrari in its one-make championship which, next year, will be extended to include a new Asia-Pacific series. 2010 celebrates the centenary of Alfa Romeo, and during the year many events have been organised around the world to celebrate this auspicious occasion. One of these gatherings was held between 19 � 27 June, at the Parco Espozioni Novegro, close to Milan�s Linate Airport, where an exhibition titled �100x100 cento alfa per cent�anni� (one hundred Alfas for one hundred years). The event was organised by the Alfa Blue Team, C.M.A.E. and the ASI, and brought together a truly eclectic selection of the marque for aficionados and visitors to enjoy. A bright and breezy day greeted the Ferrari Owners� Club for their annual track day on the full Brands Hatch GP Circuit, one of a number of track days they organise at various circuits around the country during the year. The Gaisberg near Salzburg can look back on a long history of hill climbs. After the first edition in 1929 and a few more before the war this hill climb became even part of the European Hillclimp Championship in the 1960s. In 1968 the famous Porsche 909 Bergspyder in the hands of Gerhard Mitter set the record time of 3:41:54 minutes for the 8.6 km up the hill but several fatal accidents during the years led to the final edition in 1969 when the cars and bikes roared up for the last time. After the Lord of the Rings was soundly trounced by the Lion in the 2009 running of the Le Mans 24 Hour Race, the tables were turned in the 2010 edition, with Audi filling the podium, and all the Peugeots failing. The Peugeots were certainly the fastest cars on the track, both through the qualifying sessions and during the race, with Sebastian Bourdais claiming pole position with a lap in 3mins 19.711secs, in the # 3 Peugeot 908 HDi that he shared with Pedro Lamy and Simon Pagenaud. 230 hochklassige Oldtimer im barocken Schlosspark � so viele Fahrzeuge gab es bei Retro Classics meets Barock noch nie. Doch nicht nur die Anzahl, auch die Qualität der Fahrzeuge überzeugte. Unter 60 Fahrzeugen, die beim Concours d´Élégance nach dem strengen Reglement des Oldtimer-Weltverbands FIVA bewertet wurden, machte der Mercedes-Benz 710 SS von 1929 mit Castagna-Karosserie das Rennen. Denunciation of concealment and falsification against the Dubbini brothers, entrepreneurs in the coffee business in Padova: They have been accused of having cloned five historic Ferraris. The family is a well-known coffee dynasty in the Euganea Zone of Padova. This year's International Bugatti Meeting was held in Salzburg organized by the Austrian Bugatti Club. Every year another national club is entrusted with the organisation so 43 Bugatti headed for Austria this year. One year after the centenary meeting in Italy and with the fresh impressions of the Alfa Meeting at the same place the expectations were full of pleasant anticipation. The weekend of the 3.-6.June saw the third edition of this classic exhibition in Friedrichshafen. Being the home town of Maybach and ZF, Friedrichshafen is not just linked to the automotive industries but also to the famous Zeppelin airships. This and the nearby Bodensee makes no surprise that this show is not just dedicated to classic cars as many others but to all things mobile on the road, the air and at sea. On 80.000 sq. m. cars, bikes, lorries, tractors, ships and planes were displayed during the 4 days. This was not an auction to be remembered, the highest hammer price was achieved by Lot 147 a Cameron Milar 250 F, a Mercedes-Benz 500 Cabriolet sold for €271,500 a Ferrari F40 sold for €255,000 and 3 other cars sold for €100,000+. The star lot 133 failed to sell the Ferrari 166 Inter Cabriolet did not sell for a high bid in the area of €850,000. Bigger ! Faster ! Better ? The BMW-Museum in Munich right beside the corporate headquarters first opened in 1973. The heritage protected building by the architect Prof. Karl Schwanzer has become one of the town´s landmarks called �Museums-Schüssel� ( �museums bowl� ) and featured the company´s history for about 30 years. In 2002 the lack of exhibition space made a new concept necessary. Whereas other companies decided in the same period the construction of a totally new museum for one or the other reason BMW made the decision to extend the existing building. The Lamborghini factory museum opened in a new glass walled structure to the right of the main factory entrance in 2001, and until recently there was free admission. However, presumably due to the number of visitors, plus the staffing, administration and maintenance costs, admission charges have been introduced. The standard admission fee is 12 Euros, which to my mind seems rather high for what is essentially a two storey car showroom, when compared to the 15 Euros charged by the Galleria Ferrari not a million miles away in Maranello. As a prelude to our full report on the always wonderful Concorso d�Eleganza in the grounds of the magnificent Villa d�Este on the western shore of Lake Como, we bring you this selection of images as an appetiser for what is to come in the next few days. The Tour Auto is one of the "must have driven" events ... it is difficult to imagine, in each edition is different and full of surprises .... the Tour Auto has crisscrossed France, for a long time and everyone knows that the each year is unique and even better ... let Peter Singhof take you from the start in Paris for 5 days. Grimaldi Forum in the Principality of Monaco, has been hosting the �Top Marques� event for seven consecutive years. �Top Marques� bills itself as �the only live supercar show in the world�. Indeed, besides presenting the latest supercars to an affluent public, this event enables the visitors to test the cars on Monaco streets. So the show is not limited to the Grimaldi Forum, the entire Principality becomes the venue! The 12th annual RM �Automobiles of Amelia Island� auction took place on Saturday 13 March, preceding the Concours d�Elegance on the Sunday. The auction proved that the collector car market continues to be buoyant, even in the continuing difficult economic times. They posted an 88% sale rate of the 112 lots that crossed the block during the afternoon and evening, grossing more than $19 million in total, with four cars breaking the $1 million mark, three of which were Ferraris. The overall sale percentage and total sales value, exceeded their 2009 figures for the same auction by 5% and $7 million respectively. The fifteenth running of the Amelia Island Concours d'Elegance, held at the Ritz-Carlton Hotel and on the adjacent fairways of The Golf Club of Amelia Island at Summer Beach, had Richard �The King� Petty as the Honoree for the 2010 edition, and featured a special class for the cars that he drove through his long and illustrious career. The inaugural Gooding & Company auction at Amelia Island will be held at 5.00pm on Friday 12 March as a new major part of the prelude to the Concours d�Elegance on Sunday 14 March. The venue for the auction is the grounds of The Racquet Park on Amelia Island Plantation, one mile south of Amelia Island Parkway on Florida A1A. The traditional RM Auction will precede the Amelia Island Concours d�Elegance in the grounds of the Ritz-Carlton Hotel & Resort on Amelia Island. This will be the 12th running of their Amelia Island auction, where they have a proven track record, having sold over 25 one million-dollar-plus vehicles at the venue over the years.